I'm dressed for the garden and my tea's gone cold, but before I head off to deadhead the marigolds (and have more tea,) and ultimately end up back inside (knitting and listening to Melodica,) here's someone I met the other day out in my tray of sweet pea seedlings: Hello! He/She's looking at you with one beady eye-stalk! Cute! I met another such fellow/lady last night as I was dividing a clump of Echinacea donated to my cause from my mom's back garden. I set him/her down in one of the mint patches for safe keeping. He/she can eat all the mint he/she likes, if he/she so chooses. Plant-acquisition around here has been at an all-time high as we're finally working on landscaping the front garden. I've spent the past few days coated in a fine grime comprised mainly of dirt, sweat, sunscreen and bug spray (the latter two help the dirt stick better,) but the result is totally worth it. The pattern will be ready sooner than you think, should you be interested in acquiring a copy. I think I may actually have a wee contest with pattern giveaways to celebrate the release of this one. I'll keep you posted. In other news, anticipation is high in these parts for the First Fall + Holiday Headstart 2010 issue of Knitty, (even more so than usual,) mainly because I have a pattern in it. You're going to want to check that one out. Don't forget! Ok, you are so much crazier than I thought. Those socks are insane!! Lovely but insane!! June 24, 2010 at 2:21 p.m.
June 24, 2010 at 2:30 p.m.
June 24, 2010 at 4:33 p.m.
@Adriana and @JelliDonut --> Thanks so much! @LEO --> A good question, that! I'm working to remedy that right now, actually. June 24, 2010 at 5:21 p.m. 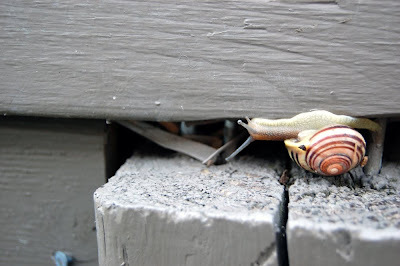 I've never seen a snail that big and colorful! 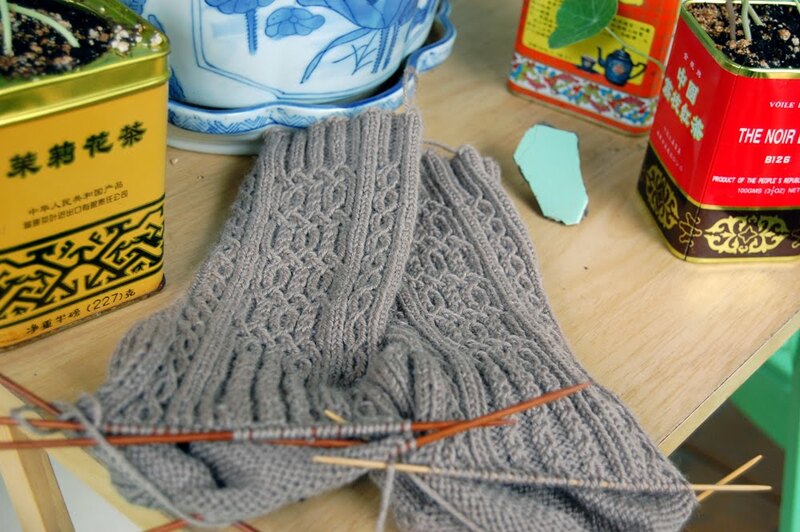 These socks look wonderful, I look forward to seeing them finished! And of course, I already look forward to see your contribution to the next Knitty! Have a great weekend! June 25, 2010 at 7:03 p.m.
Can't wait to see what patterns you have in Knitty! Yey, a contest! Awesome! June 26, 2010 at 1:27 p.m. I concur with those socks being insane... in a gorgeous way! Thank goodness, because the knitting world is seriously lacking in interesting mens' sock patterns. June 26, 2010 at 2:07 p.m.
Gorgeous. As per your usual, spillyjane. June 28, 2010 at 1:21 p.m. Fancy some Mittens With Pints On?